"Trepanation" redirects here. For other uses, see Trepanation (disambiguation). Not to be confused with Trepanging. Detail from The Extraction of the Stone of Madness, a painting by Hieronymus Bosch depicting trepanation (c.1488–1516). Trepanning, also known as trepanation, trephination, trephining or making a burr hole (the verb trepan derives from Old French from Medieval Latin trepanum from Greek trypanon, literally "borer, auger") is a surgical intervention in which a hole is drilled or scraped into the human skull, exposing the dura mater to treat health problems related to intracranial diseases or release pressured blood buildup from an injury. It may also refer to any "burr" hole created through other body surfaces, including nail beds. It is often used to relieve pressure beneath a surface. A trephine is an instrument used for cutting out a round piece of skull bone. In ancient times, holes were drilled into a person who was behaving in what was considered an abnormal way to let out what people believed were evil spirits. Evidence of trepanation has been found in prehistoric human remains from Neolithic times onward. The bone that was trepanned was kept by the prehistoric people and may have been worn as a charm to keep evil spirits away. 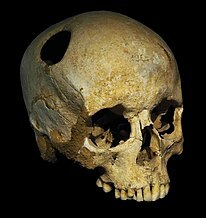 Evidence also suggests that trepanation was primitive emergency surgery after head wounds to remove shattered bits of bone from a fractured skull and clean out the blood that often pools under the skull after a blow to the head. Such injuries were typical for primitive weaponry such as slings and war clubs. There is some contemporary use of the term. In modern eye surgery, a trephine instrument is used in corneal transplant surgery. The procedure of drilling a hole through a fingernail or toenail is also known as trephination. It is performed by a physician or surgeon to relieve the pain associated with a subungual hematoma (blood under the nail); a small amount of blood is expressed through the hole and the pain associated with the pressure is partially alleviated. In abdominal surgery, a trephine incision is when a small disc of abdominal skin is excised to accommodate a stoma. Although the abdominal wall does not contain bone, the use of the word 'trephine' in this context may relate to the round excised area of skin being similar in shape to a burr hole. The perimeter of the hole in this trepanated Neolithic skull is rounded off by ingrowth of new bony tissue, indicating that the patient survived the operation. Dr. John Clarke trepanning a skull, ca. 1664, in one of the earliest American portraits. Clarke is alleged to have been the first physician to have performed the operation in the New England Colonies. Trepanation is perhaps the oldest surgical procedure for which there is archaeological evidence, and in some areas may have been quite widespread. At one burial site in France dated to 6500 BCE, 40 out of 120 prehistoric skulls found had trepanation holes. Many prehistoric and premodern patients had signs of their skull structure healing, suggesting that many of those subjected to the surgery survived. Another skull with a trepanation hole was found at burial site Chalaghantepe (Agdam Rayon, Azerbaijan) dated to the 5th millennium BCE. More than 1,500 trephined skulls from the Neolithic period (representing 5 to 10% of all Stone Age skulls) have been uncovered throughout the world – from Europe, Siberia, China and the Americas. Most of the trephined crania belong to adult males, but women and children are also represented. A cow skull dating to 3400-3000 BCE upon which trepanation had been performed was discovered in France. In the more recent times of postclassical pre-Columbian Mesoamerica, evidence for the practice of trepanation and an assortment of other cranial deformation techniques comes from a variety of sources, including physical cranial remains of burials, allusions in iconographic artworks and reports from the post-colonial period. Among New World societies trepanning is most commonly found in the Andean civilizations, such as pre-Incan cultures. For example, the Paracas culture Ica, situated in what is now known as Ica, located south of Lima. It has also been found in the Muisca Confederation (in modern-day Colombia) and the Inca Empire. In both, even cranioplasty existed. Its prevalence among Mesoamerican civilizations is much lower, at least judging from the comparatively few trepanated crania that have been uncovered. The archaeological record in Mesoamerica is further complicated by the practice of skull mutilation and modification carried out after the death of the subject, to fashion "trophy skulls" and the like of captives and enemies. This was a widespread tradition, illustrated in pre-Columbian art that occasionally depicts rulers adorned with or carrying the modified skulls of their defeated enemies, or of the ritualistic display of sacrificial victims. Several Mesoamerican cultures used a skull-rack (known by its Nahuatl term, tzompantli), on which skulls were impaled in rows or columns of wooden stakes. Even so, some evidence of genuine trepanation in Mesoamerica (i.e., where the subject was living) has survived. The earliest archaeological survey published of trepanated crania was a late 19th-century study of several specimens recovered from the Tarahumara mountains by the Norwegian ethnographer Carl Lumholtz. Later studies documented cases identified from a range of sites in Oaxaca and central Mexico, such as Tilantongo, Oaxaca and the major Zapotec site of Monte Albán. Two specimens from the Tlatilco civilization's homelands (which flourished around 1400 BCE) indicate the practice has a lengthy tradition. A study of ten low-status burials from the Late Classic period at Monte Albán concluded that the trepanation had been applied non-therapeutically, and, since multiple techniques had been used and since some people had received more than one trepanation, concluded it had been done experimentally. Inferring the events to represent experiments on people until they died, the study interpreted that use of trepanation as an indicator of the stressful sociopolitical climate that not long thereafter resulted in the abandonment of Monte Alban as the primary regional administrative center in the Oaxacan highlands. Specimens identified from the Maya civilization region of southern Mexico, Guatemala and the Yucatán Peninsula show no evidence of the drilling or cutting techniques found in central and highland Mexico. Instead, the pre-Columbian Maya apparently used an abrasive technique that ground away at the back of the skull, thinning the bone and sometimes perforating it, similar to the examples from Cholula. Many skulls from the Maya region date from the Postclassic period (ca. 950–1400 CE), and include specimens found at Palenque in Chiapas, and recovered from the Sacred Cenote at the prominent Postclassic site of Chichen Itza in northern Yucatán. Trepanation was also practiced in the classical and Renaissance periods. Hippocrates gave specific directions on the procedure from its evolution through the Greek age, and Galen also elaborates on the procedure. During the Middle Ages and the Renaissance, trepanation was practiced as a cure for various ailments, including seizures and skull fractures. Out of eight skulls with trepanations from the 6th to 8th centuries found in southwestern Germany, seven skulls show clear evidence of healing and survival after trepanation, suggesting that the survival rate of the operations was high and the infection rate was low. In the graveyards of pre-Christian (Pagan) Magyars, archeologists found a surprisingly high frequency (12.5%) of skulls with trepanation, although more than 90% only partial (these served probably ritual purposes). The trepanation was performed on adults only, with similar frequencies for males and females, but increasing frequency with age and wealth. This custom suddenly disappears with the onset of the Christian era. The prefrontal leucotomy, a precursor to lobotomy, was performed by cutting a trephine hole into the skull, inserting an instrument, and destroying parts of the brain. This was later made unnecessary by the development of the "orbital transit" lobotomy where a spike was inserted through the eye-sockets. Trepanation is a treatment used for epidural and subdural hematomas, and for surgical access for certain other neurosurgical procedures, such as intracranial pressure monitoring. Modern surgeons generally use the term craniotomy for this procedure. The removed piece of skull is typically replaced as soon as possible. If the bone is not replaced, then the procedure is considered a craniectomy. Trepanation instruments, nowadays being replaced with cranial drills, are now available with diamond-coated rims, which are less traumatic than the classical trephines with sharp teeth. They are smooth to soft tissues and cut only bone. The practice of trepanning also continues today due to belief in various pseudoscientific medical benefits. Some proponents claim that trepanning results in increased blood flow. Individuals have practiced non-emergency trepanning for psychological purposes. A prominent proponent of the modern view is Peter Halvorson, who drilled a hole in the front of his own skull to increase "brain blood volume". One of the most prominent advocates of trepanning was Dutch librarian Bart Huges. In 1965, Huges drilled a hole in his own head with a dentist drill as a publicity stunt. Huges claimed that trepanning increases "brain blood volume" and thereby enhances cerebral metabolism in a manner similar to cerebral vasodilators such as ginkgo biloba. These claims are unsubstantiated by research. In a chapter of his book Eccentric Lives & Peculiar Notions, esotericist John Michell cites Huges as pioneering the idea of trepanning in his 1962 monograph, Homo Sapiens Correctus, which is often cited by advocates of self-trepanation. Among other arguments, Huges contends that children have a higher state of consciousness and since children's skulls are not fully closed, one can return to an earlier, childlike state of consciousness by self-trepanation. Further, by allowing the brain to freely pulsate Huges argues that a number of benefits will accrue. After some time there was an ominous sounding schlurp and the sound of bubbling. I drew the trepan out and the gurgling continued. It sounded like air bubbles running under the skull as they were pressed out. I looked at the trepan and there was a bit of bone in it. At last! Feilding also performed a self-trepanation with a drill, while Mellen shot the operation for the short film "Heartbeat in the Brain", which was long thought to have been lost. Portions of the film can be seen in the documentary A Hole in the Head. Michell also describes a British group that advocates self-trepanation to allow the brain access to more space and oxygen. Other modern practitioners of trepanation claim that it holds other medical benefits, such as a treatment for depression or other psychological ailments. In 2000, two men from Cedar City, Utah, were prosecuted for practicing medicine without a license after they performed a trepanation on an English woman to treat her chronic fatigue syndrome and depression. ^ Harper, Douglas. "trepan". Online Etymology Dictionary. ^ τρύπανον. Liddell, Henry George; Scott, Robert; A Greek–English Lexicon at the Perseus Project. Liddell, Henry George; Scott, Robert; A Greek–English Lexicon at the Perseus Project. ^ a b Weber, J.; A. Czarnetzki (2001). "Trepanationen im frühen Mittelalter im Südwesten von Deutschland – Indikationen, Komplikationen und Outcome". Zentralblatt für Neurochirurgie (in German). 62 (1): 10. doi:10.1055/s-2001-16333. ^ Capasso, Luigi (2002). Principi di storia della patologia umana: corso di storia della medicina per gli studenti della Facoltà di medicina e chirurgia e della Facoltà di scienze infermieristiche (in Italian). Rome: SEU. ISBN 978-88-87753-65-3. OCLC 50485765. ^ a b Restak, Richard (2000). "Fixing the Brain". Mysteries of the Mind. Washington, D.C.: National Geographic Society. ISBN 978-0-7922-7941-9. OCLC 43662032. ^ Faria, Miguel A. (2015-05-07). "Neolithic trepanation decoded- A unifying hypothesis: Has the mystery as to why primitive surgeons performed cranial surgery been solved?". Surgical Neurology International. 6: 72. doi:10.4103/2152-7806.156634. PMC 4427816. PMID 25984386. ^ Ramirez Rozzi, Fernando; Froment, Alain (2018). "Earliest Animal Cranial Surgery: From Cow to Man in the Neolithic". Scientific Reports. 8 (1): 5536. doi:10.1038/s41598-018-23914-1. PMC 5908843. PMID 29674628. ^ a b Tiesler Blos, Vera (2003). "Cranial Surgery in Ancient Mesoamerica" (PDF). Mesoweb. Retrieved 2006-05-23. ^ Lumholtz, Carl (1897). "Trephining in Mexico". American Anthropologist. 10 (12): 389. doi:10.1525/aa.1897.10.12.02a00010. ^ Romero Molina, Javier (1970). "Dental Mutilation, Trephination, and Cranial Deformation". In T. Dale Stewart (volume ed.) (ed.). Handbook of Middle American Indians, Vol. 9: Physical Anthropology. Robert Wauchope (series ed.) (2nd. edition (revised) ed.). Austin: University of Texas Press. ISBN 0-292-70014-8. OCLC 277126. ^ Tiesler Blos, Vera (1999). "Rasgos Bioculturales Entre los Antiguos Mayas: Aspectos Culturales y Sociales" (in Spanish). Doctoral thesis in Anthropology, UNAM. ^ "Agyafúrt magyarok – Koponyalékelés a honfoglaláskorban – Sírásók naplója". Sirasok.blog.hu. Retrieved 2012-04-05. ^ Moniz, Egas (1937). "Prefrontal Leucotomy in the Treatment of Mental Disorders". American Journal of Psychiatry. 93 (6): 1379–1385. doi:10.1176/ajp.93.6.1379. ISSN 0002-953X. ^ Mondorf, Y.; Abu-Owaimer, M.; Gaab, M.R. ; Oertel, J.M. (December 2009). "Chronic subdural hematoma—craniotomy versus burr hole trepanation". British Journal of Neurosurgery. 23 (6). doi:10.3109/02688690903370297. ^ Joseph Cox (August 14, 2013). "An Interview with the Woman Who Drilled a Hole in Her Head to Open Up Her Mind". Archived from the original on 2016-09-17. Retrieved 2013-08-15. ^ John Doran (February 12, 2016). "I Drilled a Hole in My Own Skull to Stay High Forever". Archived from the original on 2016-08-26. Retrieved 2016-02-13. ^ Reporters Committee for Freedom of the Press (2000) ABC ordered to hand over unedited head-drilling tapes Archived August 23, 2016, at the Wayback Machine August 23, 2016, at the Wayback Machine. Wikimedia Commons has media related to Trepanation. This page was last edited on 12 February 2019, at 17:08 (UTC).